Belgian company BuzziSpace was established in 2007. Their products were an instant hit worldwide because they met an ever increasing need of bringing silence (managing noise levels) and style to open areas such as offices and lofts. It wasnt long before new products from designers like Alain Gilles, who also designed for Bonaldo and Casamania, soon followed. Alains BuzziBooth, BuzziHood, BuzziBlinds and BuzziCockpit were loved by the international press and are currently used at Microsoft, Facebook, SAS Airlines and Google. BuzziSpace's 100% ecological story soon became an example for the design industry: thanks to BuzziSpace, recycling and cool design goes hand in hand today. 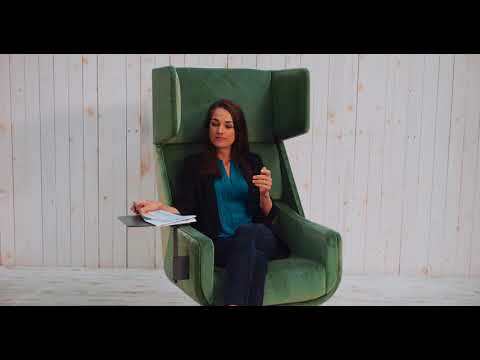 BuzziSpace also makes furniture that brings both flexibility and modularity to corporate and residential environments. For BuzziSpace the recycling of PET bottles, the basic raw material for its products, is just as important as the organic glue that is used. Their designs also meet rapidly changing environments worldwide: our offices and houses are becoming more compact and we are increasingly opting for openness. Buzzi products combine aesthetics and noise reduction thanks to sound absorbing Eco felt in great pieces that increase everyday life by fun factor ten. BuzziSpace has branches all over the world with showrooms in Chicago, Sydney, London, Rotterdam, Atlanta and of course the HQ in Antwerp, Belgium.